HAPPY 4th OF JULY! 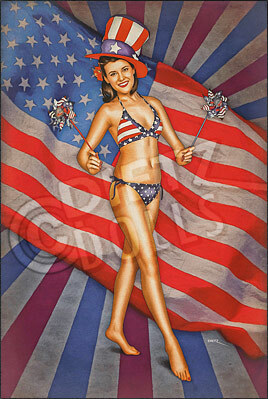 Airbrushed style pinup photo featuring Christina in this 4th of July celebration photo in honor of today's Independence Day. Wearing her patriotic best celebrating America, Christina is ready for the warm 4th of July weather in her flag themed swimsuit! Celebrating the seasons with homages to the classic holiday pinups of the 1940s and 1950s! Fun and often downright goofy, these pinups portray the girl next door and her adventures through the holidays. Prints in many different sizes are available!